Remember Angelfire, Geocities, Lycos, Excite and Microsoft FrontPage? 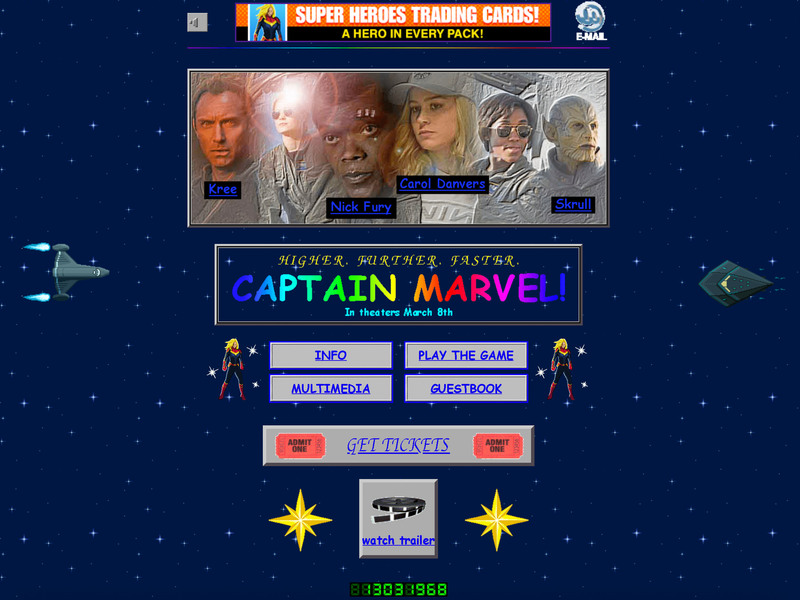 If so, Captain Marvel’s official website should bring back some memories. How did they manage to pull this off? Well, the answer is a lot simpler than you think. According to Marvel software engineer Lori Lombert: “We built this in FrontPage and host it Angelfire.” For those who have no idea what this is? Angelfire, founded in 1996, was originally a combination website building and medical transcription service. Eventually the site dropped the transcription service and focused solely on website hosting by offering only paid memberships. Read more to see what the Captain Marvel page looks like and for a link to check it out yourself. “The movie is set in 1995, and appropriately its official website looks like something made for viewing via Netscape Navigator (even if its code is a little too hefty to access without a modern broadband connection),” reports Engadget. Check it out here.